1 March 219: adult newt and damselfly larva. We have a large nature pond, which is enjoyed by park users when the garden is open - but also by birds, bees, hedgehogs etc even when we aren’t there to watch them. We also have a mini-pond to transfer spawn for close-up scrutiny - and sometimes there is a frog or two in it. We have been careful not to introduce invasive species and ask people to not bring us frogs and newts but wait for them to ‘walk in’ on their own. April 2017: new pond dipping benches/tables. They are very popular with visiting families too! They have space for dipping trays, but can also be used for seating (or even taking a nap). 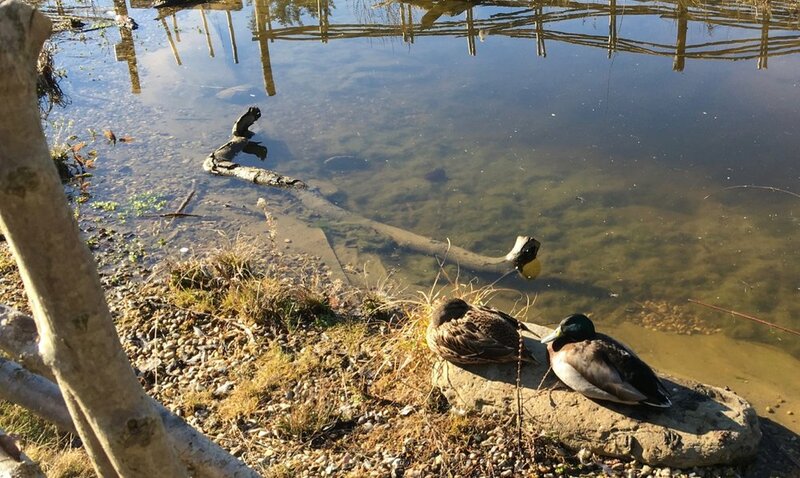 February 2019: Mallard ducks visit the pond at regular intervals - please don't feed them or they will dominate the wildlife of the pond (and eat it). You are welcome to pond dip any time the garden is open. Please be kind to the wildlife, don’t let creatures dry out and put them back into the pond. Please don’t throw any sticks or other garden things into the pond. We are very nervous about people bringing infection and invasive plant life into the garden area so please use new nets or clean them very well before using them. And please don’t walk inside the fence or fall in! When the garden volunteers are in the garden, which is most Sunday and Monday afternoons from 2 to 4, weather allowing. We are also there most Friday afternoons for Little Nightingales from 1.30 to 3. The main pond was made in October 2016, with S106 funding, by Guy Belcher, the Gaskin Brothers contractors, and garden volunteers. It is maturing well and now has more wildlife in it. Nature ponds should be in a sheltered sunny location, not too close to trees. We made ours in the main bowling green area, next to the tarmac path so people can get to it easily for pond dipping. The other sides are very shallow for both wildlife and safety. Sign for the hibernaculum at the 'back' of the pond. The pond was made of a layer of geotextile, covered by pond liner membrane with a layer of geotextile on top. The shelves are covered with gravel, with some flat-topped stones and some logs from the park and local nature reserves. Some water plants were moved from local nature reserves and Guy's garden into the gravel areas and some oxygenating weed planted in pots. The pond has a variety of depths and very shallow edges, for both wildlife (especially hedgehogs) and child safety. Bees and birds like to have a pond to visit too. We have an accessible rail along a 3m boardwalk in the corner for pond dipping. In theory, it has a bog garden area behind the pond, which one day we might get around to planting. It also has a hibernaculum (literally a 'tent for winter quarters'; instructions on RSPB website). In 2019, we aim to survey the pond a bit more than in the past - this can link with the RHS/Wildlife Trust’s Wild in the Garden theme this year, which is ponds. In 2016, before we made the pond, we spotted several frogs and a toad in the garden. In October 2016: the main pond was completed. In the first Spring of 2017, wildflowers and pictorial meadow annuals self-seeded on the mound around the pond. It looked very pretty. March 2017: small patch of frogspawn in the pond. In March 2017, we had one small patch of frogspawn, which seemed to hatch. On 11 May 2017, we spotted our first fat tadpoles (no legs yet). In 2018, thick, long grass had replaced the wildflowers around the pond. 22 May 2017: Deniz found a tadpole - but also there were froglets with legs so maybe we had at least two lots of spawn. In Summer 2018, we spotted adult and baby newts and had at least two lots of frogspawn. Lots of damsel and dragonflies. In February 2019, we spotted our first newt. We also completed the planting of living willow cuttings, which we hope will grow into the fence to eventually replace it. 22 May 2017: a few creatures from the pond. The short video we took was better - they move very quickly. On 1 March 2019, another newt and a damselfly nymph (see photo above). One or two pairs of mallard ducks are also visiting intermittently (see photo above). The planting in the bog garden but we need to make sure it will stay damp. The woven hazel fence around the area - it needs a gate. We'd like to work with volunteers from Cambridgeshire and Peterborough Amphibian and Reptile Group (CPARG) too - in ecology surveys etc. The largest test pit, showing poor quality white clay in the deepest part. In late April 2016, we dug three test pits at different depths, sampled the underlying clinker and clay and filled them with water. We found the clay to be very deep but not of sufficient quality to use on its own for a pond liner - it would crack and also probably wouldn't clear for good pond dipping and aesthetics. The water drained quite quickly too. This was disappointing but means that we could revert to the original plan of using a mechanical digger, pond liner and geotextile for a quicker and less-risky technique. See the CambridgeWild webpage for useful links.